In the Name of the Father is a 1993 biographical courtroom drama film co-written and directed by Jim Sheridan. It is based on the true story of the Guildford Four, four people falsely convicted of the 1974 Guildford pub bombings, which killed four off-duty British soldiers and a civilian. The screenplay was adapted by Terry George and Jim Sheridan from the autobiography Proved Innocent: The Story of Gerry Conlon of the Guildford Four by Gerry Conlon. The film was positively received by critics, and received seven Academy Award nominations, including Best Actor in a Leading Role (Daniel Day-Lewis), Best Actor in a Supporting Role (Pete Postlethwaite), Best Actress in a Supporting Role (Emma Thompson), Best Director, and Best Picture. Gerry Conlon is shown in Belfast stripping lead from roofs of houses when security forces home in on the district with armoured cars, and a riot breaks out. Gerry's father, Giuseppe Conlon, later saves him from IRA punishment, and he is sent off to London to stay with his aunt, Anne Maguire, for his own good. Instead, he finds a squat, to explore, as he puts it, "free love and dope". In October 1974, Gerry happens to gain entry to a prostitute's flat and he steals the £700 he finds there and chats briefly with a man sitting in a park. On that evening in Guildford, southwest of London, there is an explosion at a pub that kills four off-duty soldiers and a civilian, and wounds sixty-five others. Az angliai Guilford városában 1974 nyarán az IRA egyik bombamerénylete öt ártatlan áldozattal végez. De ennek a merényletnek más áldozatai is voltak. Gerry Conlon-ra váratlanul törték rá az ajtót a rendőrök. Családja szeme láttára hurcolták el és vitték a rendőrkapitányságra, ahol azzal vádolták, hogy ő is részt vett a guilfordi merényletben. Hiába bizonygatta ártatlanságát - a több napig tartó kényszervallatás hatására Gerry aláírt egy hamis vallomást, amelyben vállalta a felelősséget a merényletért. Gerryt évtizedes börtönbüntetésre ítélték, családját meghurcolták, később pedig apját is megvádolták bűnszövetséggel és az idős férfit is börtönbe zárták - utolsó napjait is rabságban töltötte, a börtönben halt meg. Model, now actress, Saffron Burrows made her feature film debut in the film, as Gerry Conlon's free love-interest at a commune/squat in London at the time of the bombings. 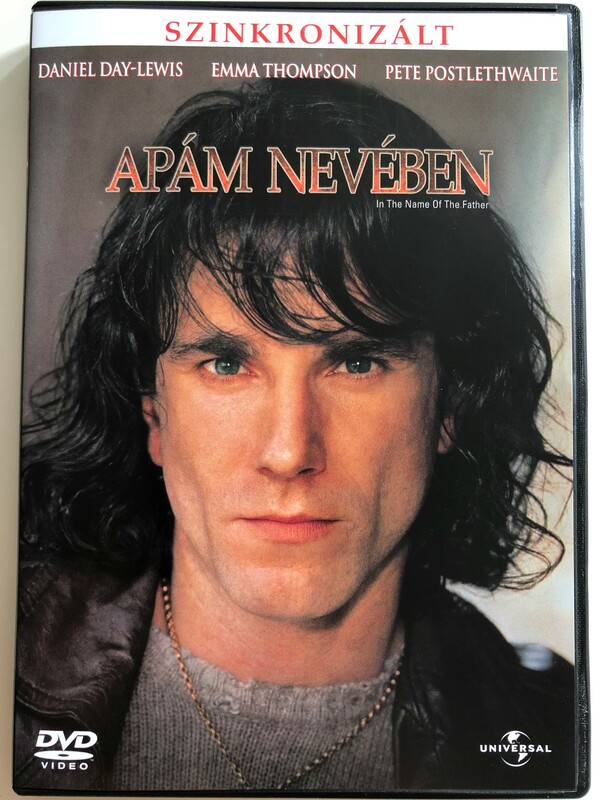 Click the button below to add the In the Name of the Father DVD 1993 Apám nevében / Directed by Jim Sheridan / Starring: Daniel Day-Lewis, Emma Thompson, Pete Postlethwaite to your wish list.